Scarlett never left the small island where he lives with his sister Tella and the cruel father. All hope to join the Caraval, the Roadshow mysterious legendary that everyone dreams to see, seems to ramble when he learns that his father has already made arrangements to give her in marriage to a guy she doesn't even know. And a surprise comes the invitation so much waited: along with her sister, Scarlett flees, but just arrived at Caraval, Tella is kidnapped. Scarlett discovers that the only way to find it is diving into the Caraval, and solve the treasure hunt at the heart of his shows. Soon, however, dream and waking seem to get confused, and risks along the track of clues you are definitely dangerous. 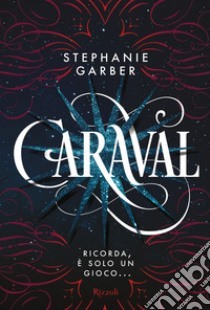 Promozione Il libro "Caraval" su Unilibro.it è nell'offerta di libri scontati Scopri tutte le novità appena arrivate #inLibreria! Recensioni Scrivi la tua recensione del libro "Caraval"
libro di Morgan Richard K.